Introducing the RobotGeek Pumping Station. A neat tidy box that gives you everything you need to add pumping air or liquid to your Arduino projects. Great for barbots, refilling pet bowls, plant watering, refilling aquariums, or DIY squirt guns. The RobotGeek Pumping Station has an internal relay to run the pump, a manual override button for easy priming and cleaning, a DC jack for easy wiring, and external access to all ports and connectors so you don’t have to take it apart ever. The pump self primes and does not have back flow when shutting off. That means it can pour accurate amounts of liquid because the liquid doesn’t run back up the tubing when the pump shuts off. 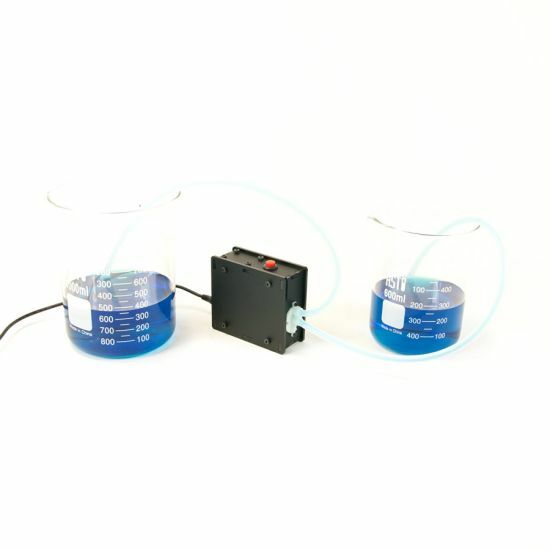 Great for barbot applications. At 6 volts it pumps 0.8L/m and at 12 volts it does 1.2L/m. We also carry food safe tubing to work with the Pumping Station. It is made of soft silicone so it is very easy to work with and conforms nicely to any curve or tight space. Check out Thor-Mang, the DYNAMIXEL PRO based Humanoid! ROBOTIS has just posted a video of THOR-MANG to their youtube channel. THOR-MANG is a collaboration between ROBOTIS, Virginia Tech, the University of Pennsylvania and Harris. This human sized robot uses the new DYNAMIXEL PRO line of robot actuators. THOR stands for Tactical Hazardous Operations Robot – a humanoid designed to operate in environments that are hostile to humans. This teaser video shows THOR-MANG activating a shut-off valve, and you can see even more tasks in another teaser video released earlier last month.